LED light bulbs have been lighting up everything from homes to art installations, and it seems even the most iconic light fixtures have been getting eco-friendly updates. 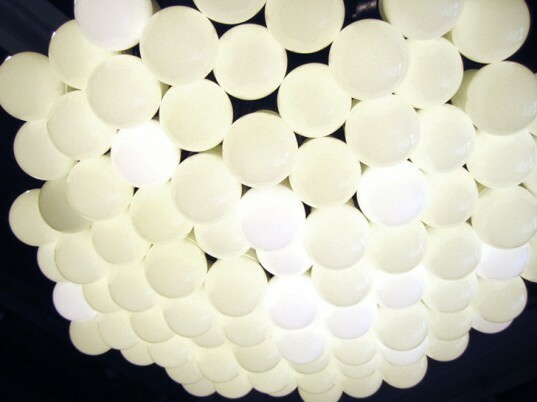 Case in point: Droog‘s famous 85 Lamps chandelier is now available in LED form. Designed by Rodi Graumans, the chandelier first hit the market in 1993 and became an instant classic with its simple, unadorned design. With its functional elements completely on display, this stylish design makes for an eye-catching and playful centerpiece that you can now enjoy without the high energy bill (the new chandelier boasts about an 83% savings). Announcing the transition on their website, Droog notes that “Since the first production of the 85 Lamps… the world has changed tremendously,” and one of those changes was customer demand for an update to LED bulbs. The result is a staggeringly more efficient chandelier. Treehugger noted in 2006 that at “15 watts each, or 1275 watts hanging,” 85 Lamps use of multiplicity was rather on the wasteful side. 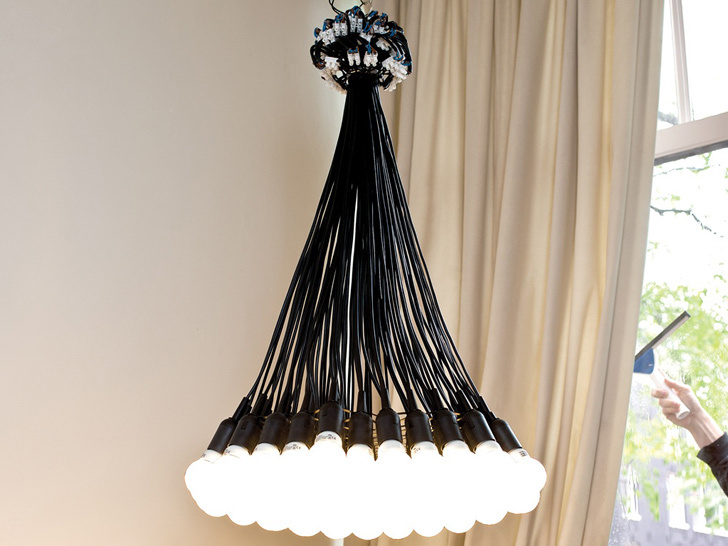 The updated version, furnished with 1.2W bulbs, reduces the energy consumption of the chandelier by around 83 percent. Not only environmentally responsible, but we’d also imagine the extended life span of the LED bulbs will be a huge time saver when it comes to replacing all those bulbs. Though at €2,495,00, plus the eventual cost of replacement bulbs, this classic may still be out of the reach of many. LED light bulbs have been lighting up everything from homes to art installations, and it seems even the most iconic light fixtures have been getting eco-friendly updates. Case in point: Droog's famous 85 Lamps chandelier is now available in LED form. Designed by Rodi Graumans, the chandelier first hit the market in 1993 and became an instant classic with its simple, unadorned design. With its functional elements completely on display, this stylish design makes for an eye-catching and playful centerpiece that you can now enjoy without the high energy bill (the new chandelier boasts about an 83% savings).